3 shinies, including a 96% 131515 Salamence at level 27, and a 100 pichu hatched (both within a minute of each other) Two solo raids (Piloswine, my second soloing that, and my first time soloing granbull, can be found on my yt channel). And two armed popo officers at the house across the street from us, couldn’t get a pic due my dad sending me downstairs into my room for safety, so that was fun lol. Very fun and amusing today. Dang! It took a few hours to get my 1st shiny. Went to the spot where I do the majority of my CD’s. Lured up the 4 Stops and all was ok apart from not getting any Shiny in the first hour. Then the spinning circle of death arrived and made the game unpleasant and un enjoyable. Constant freeez ups and severe lag was the theam for the next 90mins. And hour extension was given but I only lasted 15min and decided to go look for some Bagon Raids in hope I could ensure I had a great one for evolution. Could only find Snorut and Driftloon on Gyms. Was headed for an egg hatching in 10mins when I got a phone call from a friend that there was a 98% in front of her house. With barely enough time to get to her place from where I was before the 1hr extension ended I made the dash getting to her place 2min after the 1 hour the extension time and luckily the game had been extended by another hour. Caught the 98% along with about 10 others spawned at her place picking up my 4th Shiny. Did 2 Bacon Raids on the way home while letting the Go Plus picking up any strays. All up 183 Bacon with 4 Shiny terrible IV. No IV 90% or above at my CD spot and no great ones from 18 Raids. If it hadn’t been for my friend having to play from home on the day instead of joining me like she normally does my CD would have been a complete failure again. Seriously questioning why I’m planing my life around these CD’s. If I don’t have great ones pre CD I’m just wasting my time. @NotanotherKangaskhan the spinning wheel of death can ruin the best day of gaming:| sorry to hear it messed up your CD! We had some construction stuff to do, but we finished in time and I was able to play the whole 3 hours. According to my before/after screenshots I have seen 164 Bagon and caught 162 of them. About 90% of them were fed a pinap berry and so I made a nice amount of candy. I also had been asked the favor of catching and evolving any level 30 (we had no weather boost) for my first lucky trade, because my first (and up to now still only) lucky friend wasn’t able to play this time. Of course I did as I had been asked. We also did 2 legendary raids during the 3 hours. It was a nice and rather successful afternoon. I even broke my shiny record… I got 11 shinies… I have no idea what to do with them… I don’t want to transfer them, but I guess they won’t be too valuable for trading either. 11/164 is a great drop rate. I’ve never got close to that may from that amount of catches at any CD. 2-5 is all I’ve ever seen from around a similar amount of seen in 3hrs. I think December will feature all the Pokémon featured in 2019’s Community Days again, just like last year. Got 6 shinies… on the other ones the highest was a 66% (129 caught). Got 3 shines below 50 CP… the one with 14CP is the funniest one. And got Shieldon. After been walking around for more than 16km, was on the last 10 minutes. Shieldon shows on a pokestop on the other side of the park. Got there, forgot to change the ball and it runned. Cursed like everything. A girl thought i had seen a shiny bagon running away. Got some more bagon. 18:00, Bagon was gone… Shieldon was back. One more for the pokedex. Nincada got 3 and half candies. 32 more to go. Nincada got 3 and half candies. 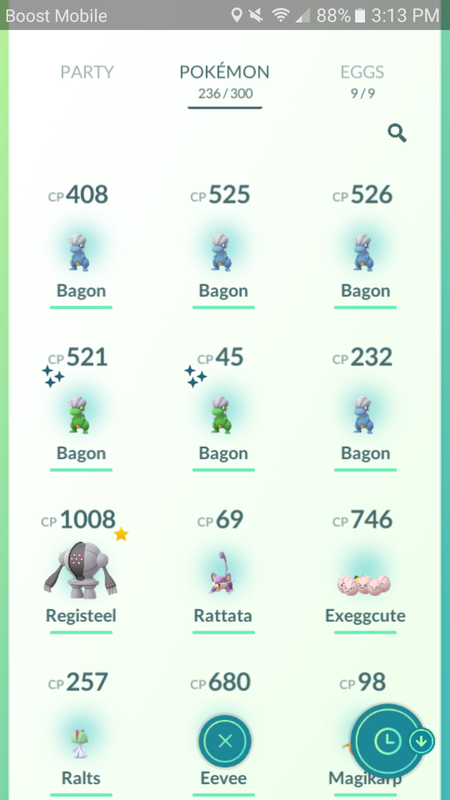 About how many Bagons did you get during the most recent Community Day? Unexpectedly, the next one is Torchic, who wouldve guessed?